I support several fundraisers and/or events every year. I will post fundraisers and events that are I'm currently supporting. Check back often!!! My name is Kristal and this is my son Brett Wilson. Help me fight this battle by donating a recipe to our first fundraiser cookbook. 50% of the profits from the cookbook will be donated to SMA Support. The other 50% will be put in the "Brett Jacob Wilson SMA Fund" set-up at the Bank of America. This fund has been set-up in order to assist us with the astronomical costs of equipment that Brett needs and has been denied by insurance. We've all witnessed what a single $1 can do if people are willing take a few minutes and mail it. Just think of all of the yellow bracelets that you see around - I hear Lance Armstrong raised more than a million for cancer research. I'm going to try to do the same :0) Ok -- maybe not a million, but heck what about $1,000 or $5,000 or even $10,000. I'm asking you to give a $1 -- not for a yellow bracelet or any bracelet at all but just for the knowledge that you will be helping families and kids living with SMA -- helping them get the proper equipment, medicine or other support that insurance may deny. Or maybe it will just be used to send the kids something to brighten up their day or even to help pay for some of the growing piles of medical bills. Or God Forbid, help the parents pay for the funeral expenses of the child they lost to this disease. 4. Forward this email on to all of your family and friends, if you would please. Custom Made Hand-Knit hats made JUST for you! Custom design YOUR hat for YOUR needs. Auntie Jenny can match ANY coat! There is a $1.00 shipping fee per hat. 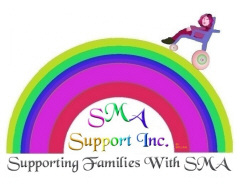 A portion of Auntie Jenny's profits is donated to SMA Support. Beautiful handmade beaded bracelets that can be personalized as specified with the name of a loved one, your name, Cure SMA etc....or if you prefer, no personalization at all! All bracelets are custom made with choice of colors as follows: Blue, Pink, Purple, Lavender or Garnet with simulated pearls for accent. Your choice of pewter spacers are Flowers, Butterflies or Hearts. All bracelets are made with stretch cord for comfort and fit and no two bracelets are alike. Bracelets are 13$ each which include S&H. 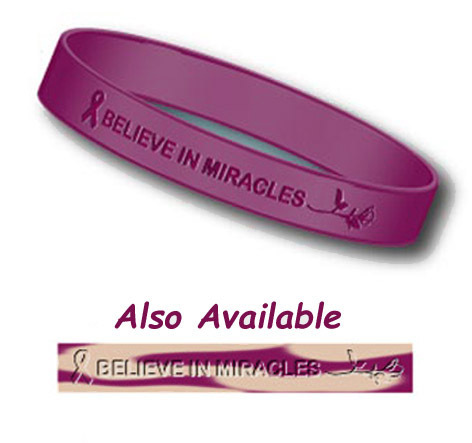 5$ from each bracelet purchased will be donated back to SMA Support. These bracelets make beautiful, personalized gifts and are the perfect way to remember someone special. If ordering for a child please specify age for fit. Orders for bracelets may be e mailed to Susan Merendino (Godmother to both Eric and Jessica Slavik SMA Type 1, two very precious SMA Angels) at smer5852@bellsouth.net Paypal payment preferred; Paypal ID is also the same as the e mail address. Or you can send check or MO to Susan Merendino, 11040 Keene Street, Spring Hill, FL 34608. Please note choice of bead color, spacer choice and name or phrase you would like to appear on your bracelet when ordering. Please allow up to one week to ship if purchased through paypal, or up to 10 days if purchased by check or MO through the US Postal Service. These bracelets are handmade with loving care with the hope of helping Laura Stants and SMA Support to continue to provide equipment, special formulas and much needed support for our very special SMA children and families. The Faces of SMA CD! and palliative care users; all are welcome. by mid June so that the company can finish and ship by mid July. This means that MJ needs your order as soon as possible. and $10.00 if you want it shipped to help cover the shipping costs. 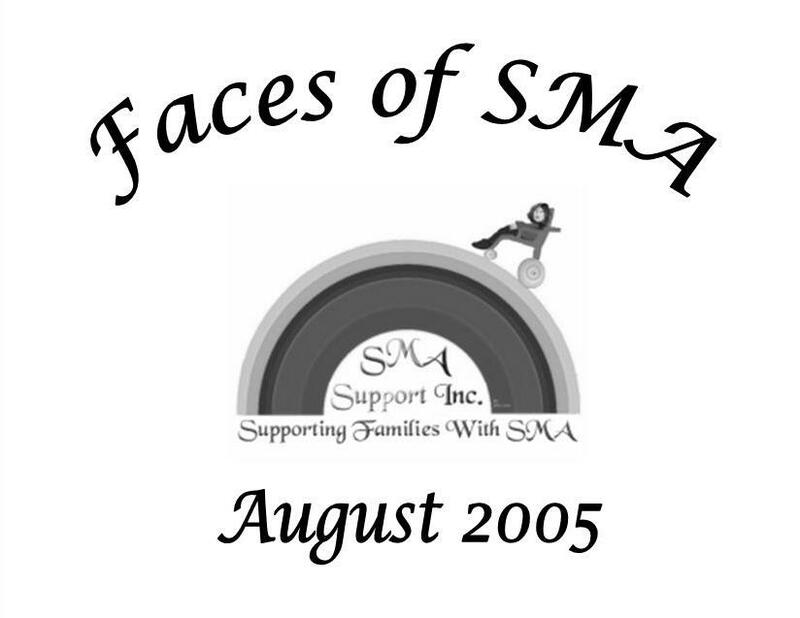 There are still copies of �The Faces of SMA� available! Please contact MJ Purk. TWEETYROLL88@aol.com for more information! Wear SMA Hope....Give SMA Hope. With Hats of Hope, SMA families across the country are literally putting on their thinking caps and looking up at Hope. They know they will do whatever it takes to find a cure for SMA, Spinal Muscular Atrophy. By choosing a hat or visor, you can bring hope into view. Each time you wear your hat or visor, don't forget to look up and see HOPE embroidered under the brim. Go to "Products" and pick out ANY of the hat(s) or visor(s) you prefer. When you check out, make sure you enter the special promotional code of SMA2005. This will give free shipping to people who order, and 40% going back to SMA! 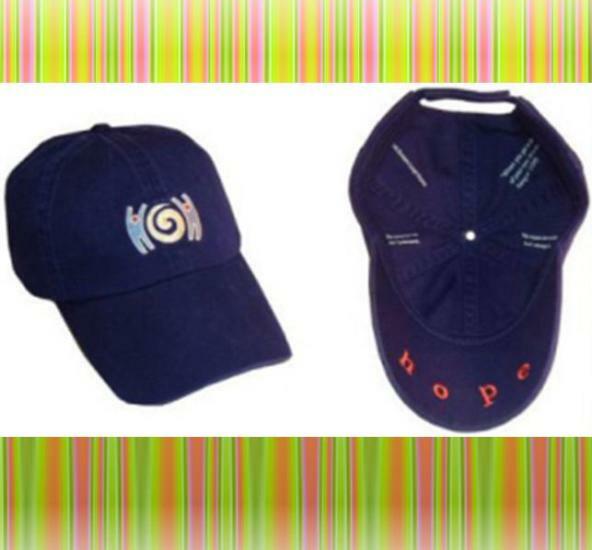 It's that simple to Wear SMA Hope and Give SMA Hope! We will do whatever it takes for a cure. Hats or Visors are $20 each. Visors have a slot on the front to put a picture of your child in it. 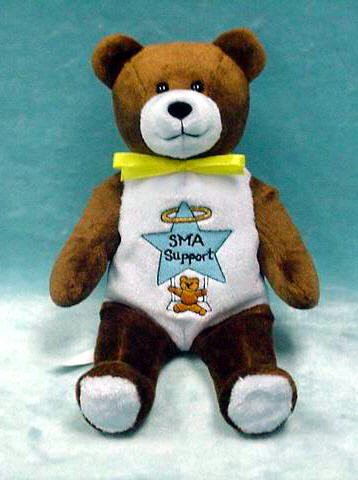 Order this sweet Holy Bear, designed by MJ Purk (SMA Type 1+). The bear is $10, and comes with the Bible verse that Nicki Ard (SMA Type 2) lived as her life motto: 2 Corinthians 12:9 ~ "My grace is sufficient for you, for POWER is perfected in weakness." Email me with your name, address, and number of bears you would like! Cole�s Quilts has recently opened a premium shop to raise additional funds for quilt fabric and shipping costs. The most exciting thing being sold right now is the 2006 Cole's Quilts Calendar! It features quilts 13-24 sent out with the owners if that picture was available. Calendars are sold for $20 each at the 2006 Logo section. 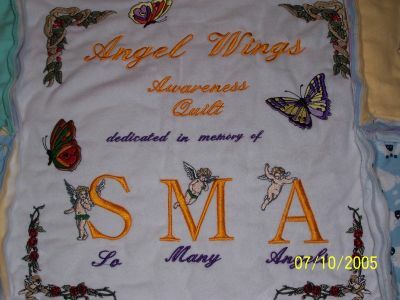 There are also 3 new lines of apparel including the 2006 Logo and Cole�s Quilts Ribbons. Also available is apparel for children, household goods, hats, bags and other fun stuff. The other exciting aspect of the new shop is 2 sections devoted to our angel, Cole. In the �Our Angel, Cole� section there are 3 designs available with Cole�s picture on them. Items include adult apparel (limited selection currently), coasters, and pillows. Also available in the �Stamps� section, are American (37 cent) stamps featuring Cole & Postage Pals, made available especially for Cole's international fans! The stamps and Postage Pals feature the many faces of Cole, from Thanksgiving to Monkey Boy Cole. Postage Pals are NOT stamps, however they can be used in edition to international stamps. Personalized international stamps are not currently available so the Postage Pals were made available for Cole's international friends! Please visit http://www.cafepress.com/colesquilts to see all the NEW products. Happy Shopping! PAYTONS PALS BANDS ARE IN!! Brand new Royal Blue Bands (just like the "Live STRONG" ones) FOR SALE NOW!! Adult & Youth Sizes are $3 per Band. Adult Bands are available now and Youth Bands will be available after May 15th. Bands can be paid for through by check. Please mail checks to the Paytons Pals address below. Miracle for Madison and Friends bracelets are in!! Brand new Maroon and Maroon and Cream colored Bands (just like the "Live STRONG" ones) FOR SALE NOW!! 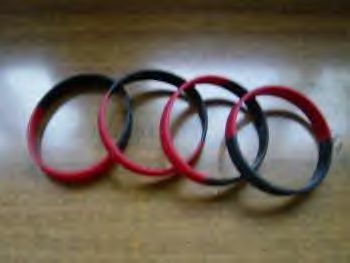 Adult Sizes are $2 per Band. Bands can be paid for by check. They are about 8" tall and $5.00 each. Contact Annette Reed at miracleformadison1@mac.com for information! You can order any of the Miracle for Madison and Friends merchandise online at the website www.miracleformadison.org hit online donation and it will take you to the Ohio State University Foundation on line giving line - once you did this email us your receipt from OSU and we will get your order out. Before you go on line please email your order first so we can give you the correct amount to send. The soil on Mars is very similar to Space Sand in terms of properties and color. This unbelievable sand will not get wet and can be formed into shapes under water. 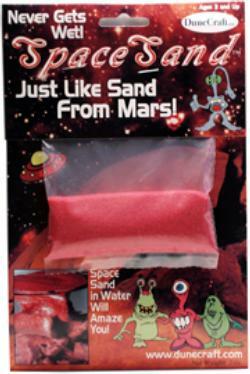 Remove it from the water with a teaspoon and it instantly turns to completely dry sand! In May, 1997, Randy and Helen Baldwin eagerly welcomed their third child, Jeffrey, as did his older siblings, Matthew and Katie. Jeffrey's arrival, unplanned but greatly anticipated, sparked a few adjustments in this family long removed from diaper duty, but Jeffrey was obviously a special gift. Eight weeks later, life took a completely unexpected downward spiral into the depths of despair when Jeffrey was diagnosed with Spinal Muscular Atrophy (SMA), a rare, progressive genetic neuromuscular disease with deadly ramifications. The neurologist handed over the utterly devastating news that Jeffrey had a severe case of the most destructive form without a morsel of hope that anything could be done to thwart the effects of the killer disease. Faced with the nightmare that their baby was expected to die within two years and that there was no treatment or cure, Randy and Helen took their faith in God to a higher level and embarked on a quest to defy SMA and its stranglehold on their precious baby's life. They sought the expertise of alternative practitioners and relentlessly relied on prayers for Jeffrey's health and for strength, courage, and wisdom for themselves and their family. 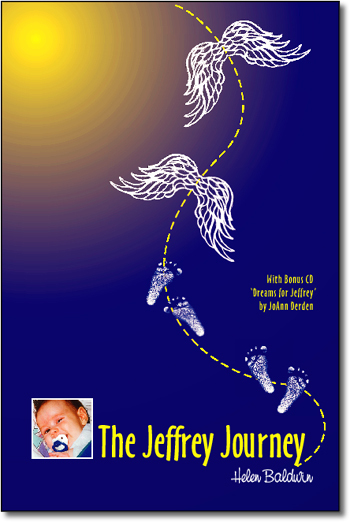 The Jeffrey Journey is the story of how one family - with friends and family, prayer, and God's grace - rose to the challenge of caring for a dying child as they also realized the countless blessings left by their angel. You can choose who you give your money to. 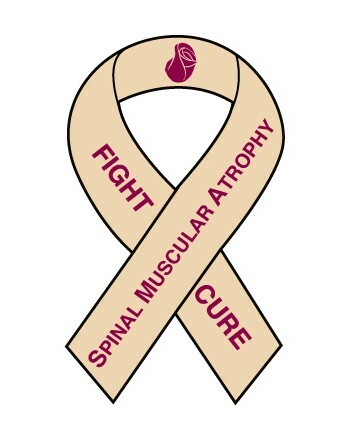 I choose to support one of the many SMA organizations!